I found this today on Twitter. It’s from Brett McCracken and it’s spot on. This is how to get wisdom. The Bible has to be the foundation, the daily bread. The farther up you go, the closer you get to desserts and snacks – appealing and tempting, but not as substantial. Notice that there are two sides for Church – local on the left and ancient church traditions on the right – and Nature and Beauty. 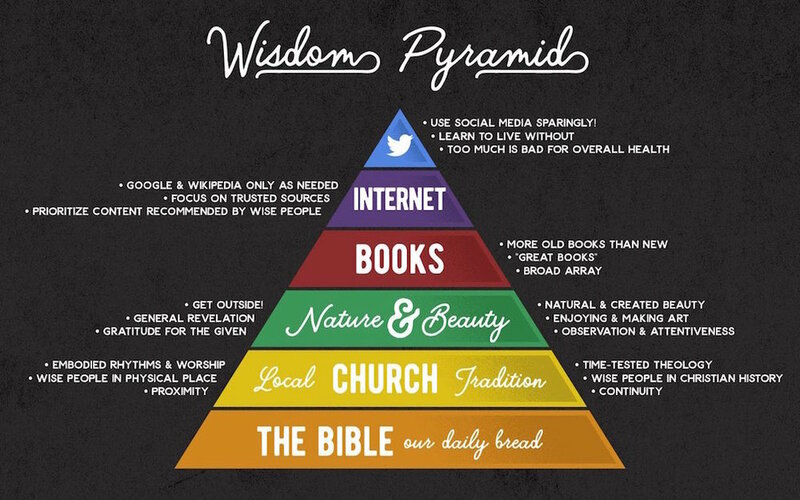 We can recognize the truth and the wisdom in this Wisdom pyramid. The challenge is to actually follow it. My warning is that if you invert this, you will not only lose out on amassing wisdom, but you will also become anxious, sleepless, hopeless, and unsteady because you will be precariously struggling for balance instead of deeply rooted in a firm foundation. “My child, if you accept my words and store up my commands within you, turning your ear to wisdom and applying your heart to understanding, and if you call out for insight and cry aloud for understanding and if you look for it as for silver and search for it as for hidden treasure, then you will understand the fear of the Lord and find the knowledge of God. . . . Then you will understand what is right and just and fair – every good path. For wisdom will enter your heart, and knowledge will be pleasant to your soul. Discretion will protect you, and understanding will guard you.” Proverbs 2:1-5, 9-11.